Some have called Bitcoin “digital gold”, while others have dismissed it as a fraud, pyramid scheme or a tool for black market criminals. What’s clear, though, is that the digital currency keeps soaring in value, and Bitcoin’s price has risen tenfold in 2017, making it a stunningly profitable investment for a lucky few. The thing is, you can’t buy a great deal of things right now with Bitcoin, although at least you could use the digital currency to purchase video games on Valve’s Steam store. But this is no longer the case, and Valve recently announced that it would not be accepting Bitcoin as a payment option anymore in a blog post (via Gizmodo). 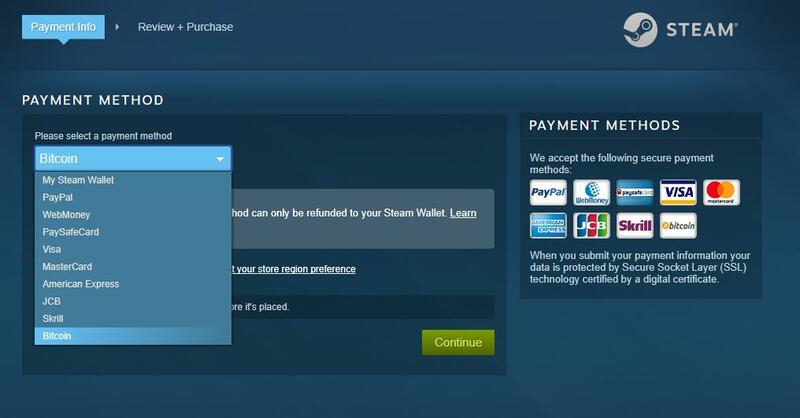 The reasons for this boil down to the high transaction fees users have to pay in order to buy games on Steam, plus the rapidly changing price of Bitcoin were blamed by Valve for discarding the digital currency as a payment method. “In the past few months we’ve seen an increase in the volatility in the value of Bitcoin and a significant increase in the fees to process transactions on the Bitcoin network. For example, transaction fees that are charged to the customer by the Bitcoin network have skyrocketed this year, topping out at close to $20 a transaction last week (compared to roughly $0.20 when we initially enabled Bitcoin)”, wrote the company on the Steam blog. Actually, Valve clearly has a point here, as it doesn’t make much sense to sell a $20 US dollar game with a $20 transaction fee on top it, and this highlights how Bitcoin’s volatility is making it useless for many retailers as a payment method right now. Because the truth is that since the digital currency was invented in 2008 by a mysterious figure (who goes by the alias Satoshi Nakamoto), its price has gone from 1 cent to almost $15,000 US dollars at the time of writing, a stunning climb indeed, but with some precipitous drops in between (the price fell more than 20 % in a matter of days last November). This has made some people see it as a store of value (similar to gold) and less like a proper currency like the US dollar or Pound are. So, will Bitcoin ever return to Steam, allowing us to pay for the latest Call of Duty game with the digital currency? This seems unlikely at the moment taking into account Bitcoin’s wildly fluctuating price and the speculative madness surrounding it, but it’s almost a given that Bitcoin and other digital currencies will be part of the video game landscape in the future, that’s for sure.